Opener was a dark match with locals. The usual ones. Pimpi beat Polvo in the opener. Octagon was bleeding early in the match, and down on the outside. He made it back in, only to be fouled by Super Fly and pinned. Champions retained their tag titles. Park beat Mesias bloody, beat him with a chair, and won with a foul. Park put a Hijo de Cien Caras mask over his victim after the match. Zorro achieved his prophecy with help from La Militia, Konnan, Dorian and a fast count from Hijo de Tirantes. Still, Zorro’s the champ. Didn’t think a team with X-Fly would end the Psycho Clown’s streak. Thought it could end with a Perro Aguayo Jr. team. As it tursn out, we got a little bit of both. Perro Jr. returned, sneaking in the cage with a Murder Clown mask, and attacking the undefeated team to make them a little bit less undefeated. edit: fixed some stuff. 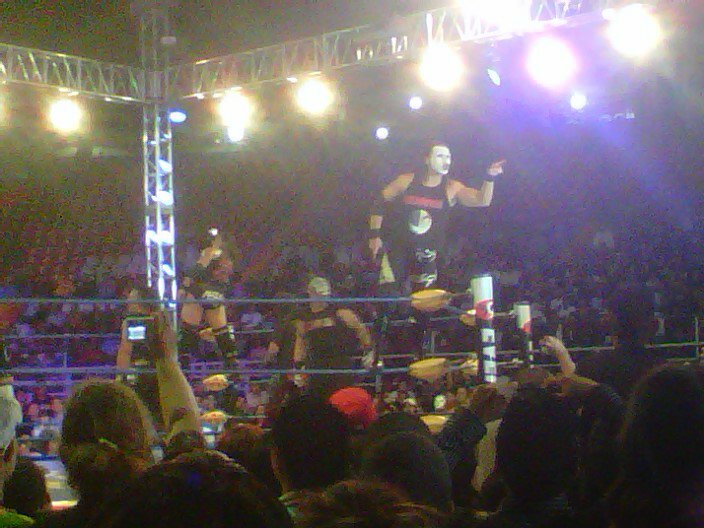 Also, check out SuperLuchas photo of Charly Manson returning – and the massive area of empty seats behind him. Cubs is so stunned he can’t even manage to write the result down. He’s still waiting for the restart. How long until Charly beats XFly for the Mex Heavyweight title on a AAA show? @Alan: I CAN ONLY HOPE. Actually, that sounds like a future IWL main event. @thecubsfan: Also could be a potential change to the Perros anniversary show. Not sure if he will still show or not, but I noticed that LLUSA was billing him as Charly Manson for their next show. @CM93: GdT went against soccer final. I’d use that as an excuse. I really believe that fans know it’s going to be a 4 hour show on a school/work night and don’t want to come out because of this. It’s not what the average fan wants and by now, GDL fans have seen enough AAA big shows to know better. So, any idea what the official number for the Psycho Circus undefeated streak ended up being? @LLL: AAA always has an excuse. I’m sure Konnan already left a message on Meltzer’s machine with a laundry list of excuses as to why the show wasn’t sold out. It’s never the promotion’s fault. If AAA sticks to their patterns (and they are not much for change) then Chesssman will defeat Zorro at Rey de Reyes. Then he will lose to wagner at TM since Wagner resigned with AAA. Exciting. This should be no excuse. The show started at 6 p.m., so they could expect that it would end not too late in the evening. @Ringo: Show ended just after 10p on a school/work night and last about 4 hours. Too long. Too late. @LLL: TripleMania was a Sunday too, right? And ended a lot later. Though that was June, so school might have not been as much an issue. @thecubsfan: That’s why I don’t like Sunday for a supershow for AAA, WWE, or TNA. But wrestling feds are run by people who don’t like change. The tradition of doing wrestling PPV’s on a Sunday started decades ago, and unless “Vince” does something different, the sheep will continue to follow. UFC and boxing are smart enough to do their shows on a Saturday. If they tried a supershow on a Sunday, it would hurt buys and attendance. Wrestling supershows would do better on a Saturday instead of the tail end of the weekend. Why do wrestling groups do PPV’s on a Sunday? It goes back to the days of syndication. Syndication aired on weekends at different times in different markets. In NYC, it aired on Ch.5 at 12p on a Saturday. In Philly, on Sunday at noon on some channel I forget. Point is, it would’ve been impossible to do a PPV on a Saturday when a percentage of markets would miss the “go home” episode before the PPV. To avoid this happening, PPV’s always took place on a Sunday night, at which point all markets would have aired the episode scheduled for the weekend. The tradition continues even though syndication is dead and the demos of wrestling have change. I would have done Triplemania on a Saturday. This is the worst thing in the history of the universe. With Charly in AAA, is the Invasores group officially dead? Or is CMLL still going to keep it “alive”? Pretty happy Zorro won the belt. Wish it were Chessman but I’ll take my other favorite AAA guy winning it too.